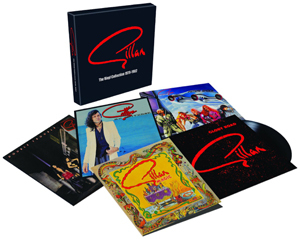 Gillan - The Vinyl Collection 1979-1982, from legendary vocalist Ian Gillan (DEEP PURPLE) has seen its release delayed and is now set to be out via Demon Records on October 7th. A trailer for the release is now streaming and you can check it out below. Gillan - The Vinyl Collection 1979-1982 houses together all five UK studio albums by the legendary rock powerhouse. All have been recreated as first pressing replicas, which means that Future Shock has the original 12x12 booklet and Glory RoadFor Gillan Fans Only. All are pressed on 180g heavyweight vinyl and housed in a rigid slipcase. Mr Universe - 1979’s Mr Universe was Gillan’s second album and the first issued in the UK. This album cemented the classic line up of former DEEP PURPLE vocalist Ian Gillan, guitarist Bernie Torme, bassist John McCoy, pianist Colin Towns and drummer Mick Underwood. High energy classic hard rock from beginning to end. Future Shock - Gillan’s 1981 album Future Shock saw these Reading Festival regulars at their lyrically most personal and diverse, taking on religion and the cold war. Aptly futuristic artwork encompassing a blistering cover of New Orleans, and "No Laughing In Heaven", an early rock meets rap chart hit. Double Trouble - Gillan’s third album in 15 months saw this 1981 double album Double Trouble feature new guitarist Janick Gers (later of IRON MAIDEN), and a slightly more melodic approach. Two chart hits and a bonus disc of live material from the Reading Festival. Magic - Magic, issued in 1982, was Gillan’s swansong before singer Ian joined BLACK SABBATH and then a reformed DEEP PURPLE. There most melodic and underrated album, it featured the blistering "Demon Driver" and a cover of Stevie Wonder’s "Living For The City". The catalogue ended on a high.